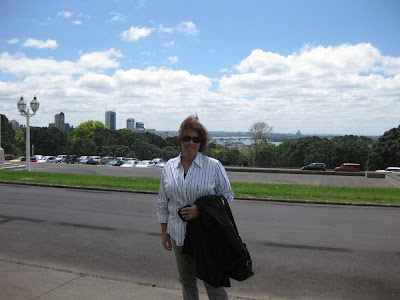 On Tuesday, we went to the Auckland Domain Historical Museum. Here is a video clip of the museum grounds. It was pretty interesting. First as you enter the main hall there was an exhibition about stuff that gets shipped to a museum and is stored forever in the warehouses and never makes it to the display areas. There were huge wooden crates with things on top of them, like stuffed sea lions, creepy old dolls, frozen baby orangutan, old military uniforms, just weird and creepy things. Here is an example of weird stuff. 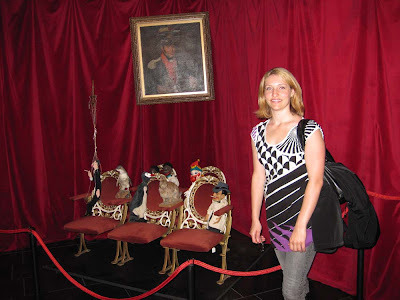 These are marionettes sitting in theater seats. There was a display of old Auckland from the early 1800's with a recreation of the shops from back then. It reminded me of Disneyland main street. They have a historical wing that shows the wartime from the past and actually has two full size airplanes. 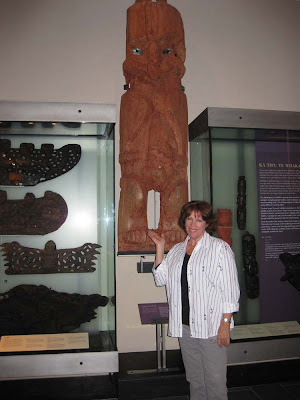 Then there's the Maori history, the indigenous people. I don't have spell check on this blog system, so try to forgive the spelling. 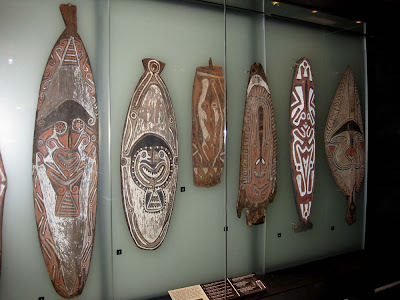 Here is a display of some shields, their hand carvings are famous here. They carve everything. 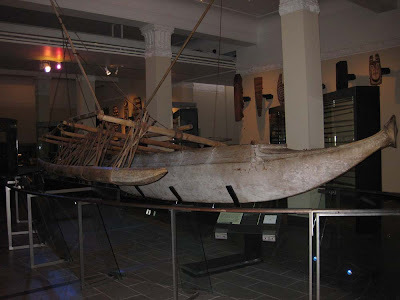 A outrigger canoe, all made by hand. 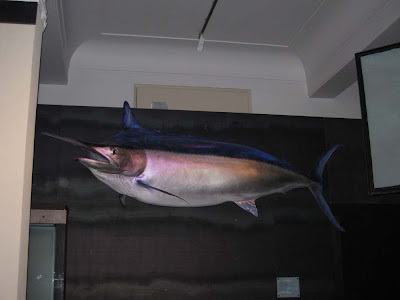 Carl, here's a black marlin, thinking of you. Shannon is resting her dogs. Out in front of the museum. me. After that we went to a town called Parnell which sort of looks like Laguna or Balboa where the little shops line the small street, and there are many art galleries. We had fish and chips for lunch. Then we went upstairs in a gallery and met an artist who was preparing for his opening exhibit that evening. 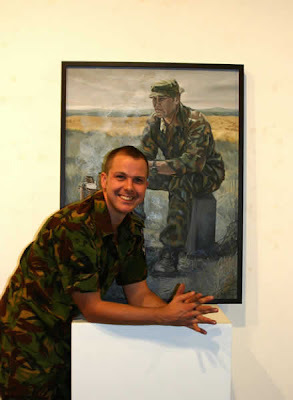 He is such a great artist, he's the official artist for the New Zealand Army. His exhibit was of the local horse races at this particular gallery. Here is a picture of Matt Gauldie, the artist. After that we went home and made dinner and Grant came over to eat with us. So that was our Tuesday. very cool! 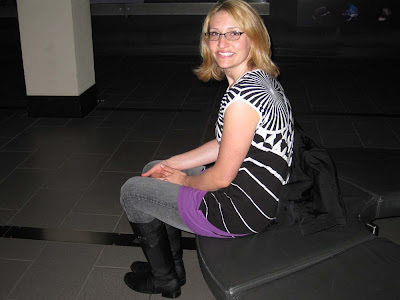 i love reading the blogs, i dont have to wait for pics when you come home. Hey Kathy! The pan is from Joann's fabric, they have it at michaels too. Cute the 50% off coupon out of your sunday ads and its only 15 bucks.